I asked myself this question after reviewing the validity period for the RHCE. See my How long is the RHCE valid post. Back then I discovered the RHCE is valid for 2 full releases after the release on which the exam was taken. The answer to one question only created another! I wanted to know exactly how many years “2 full releases” equated to in human years. 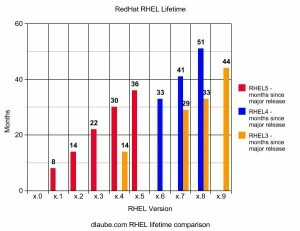 After scouring Google quite a few times, I came to realize that there isn’t any cut and dry answer as to how long a Red Hat Enterprise Linux (RHEL) release is actively developed. Sure older versions are still sort of supported once a new major release comes out, but this quest is more about getting a feel for RedHat’s release time-line. The BIG question ultimately led to some digging around through RedHat press releases over here and of course; wikipedia. 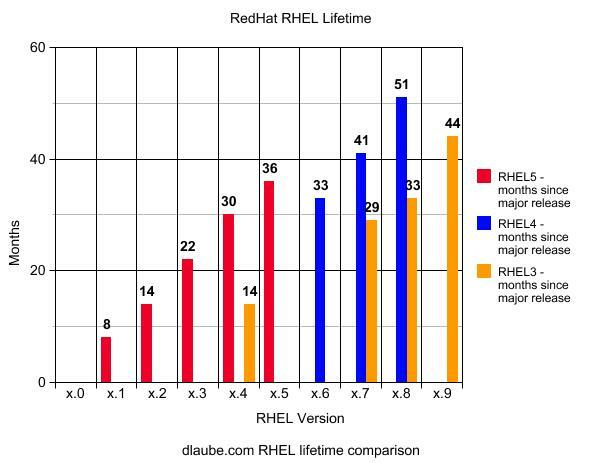 After gathering the data, I produced a quick and dirty chart comparing the different RHEL versions and their release dates by number months. Hope this helps those with the same questions floating through their heads. Armed with this information, one could guess that RHEL 5 will have a life expectancy of about 50 months. If that’s the case, then as of this post, we have just about 14 months left until RHEL 6! If anyone has any further insight, please post a comment.